169. 20 Tips to Better Negotiate Your Job Offer & Compensation Package – How to Shape Human Behavior. 00:02:55 Much of what happens during recruitment doesn’t actually happen during your job interview while you’re sitting across from the recruiter. 00:03:58 Obvious yet overlooked, the things that you do that the recruiter doesn’t like about you makes it less likely that you’ll get what you want. 00:04:03 It’s not enough that you believe you deserve it; that you deserve it must be believable and justifiable to them. Meaning, don’t ever ask for something without giving an explanation for why you think you deserve it. They need to be able to give you what you want because they like you, and because it makes sense to give it to you. 00:05:10 They may like you and think you deserve it, but if their company has constraints that prevent them from giving it to you, then you won’t get what you want. Many non-traditional jobs come with lower salaries than traditional job positions, but the non-traditional jobs may come with more creativity and flexibility in constructing a compensation package. 00:55:02 The last thing you want is to be underemployed in a company that, had you been better at negotiating and explaining yourself, would have paid you much more. It’s possible that the recruiter is undervaluing you because they’ve never worked with someone with your particular skill set and background, and therefore its your responsibilty to identify that and then correctly communicate to them in a way that they realize exactly what you’re capable of bringing into their company. 00:06:21 Don’t care too much about single elements such as your salary, bonuses, stock options, or what city you’re based in. Your main concern should be the compensation package as a whole. The more flexible you are in getting paid, and the more ways you allow them to pay you, the more likely it is you can negotiate a high-quality compensation package. If human resources agrees to this, then you need to stay at the negotiation table (tip 10 below) and stay in touch with all concerned parties to make sure there is no misunderstanding and that they honor this term, otherwise that person who agreed to it may leave the company and nobody else in human resources is aware of your agreement. 00:07:34 By asking HR to change the compensation offer, you’re asking them to go out of their way for you. Nobody will spend their time fighting for you and your compensation package if they don’t believe you will work for them; if you give them the impression that this job at this company isn’t your best job offer on the table and that you are holding out for another job. Making HR believe that everybody wants to hire you could give them the initiative they need to improve your compensation package; it might also make them decide not to do the extra work required to offer you more if you’re just going to turn them down. 00:08:36 So you’ve taken a bunch of expensive courses and workshops on negotiation, and you’ve read a ton of books on negotiation strategy, that doesn’t mean you have to negotiate everything all the time. If something is important to you and you feel you deserve it, stand up for it, but don’t haggle over every minor detail. 00:10:16 The more you know about the parties involved before, during, and after, the better equpped you are at persuading them and finding a deal that makes everyone happy. When it comes to preparing for your job interview, assume that that one piece of information that you didn’t find was the most important piece of information you needed. 00:11:14 If there are several points about the compensation package you’d like to negotiate, don’t address them separately and individually, be transparent and let human resources know about all of the points. Doing this will save time and work, and may lead to an even better compensation package than you were expecting. Approaching the negotiation point-by-point (A, then B, then C, then D) can be a technique to scrape together a better deal when you add all the pieces together, and under certain circumstances you may need to apply this strategy, but the consequences of this strategy include becoming annoying or appearing manipulative to human resources because they have more and more work to do for you in addition to their regular responsabilities, and because they don’t know how many additional demands you may make after they meet it, they may come to resent you. On the other hand, if you send them a list of points: A, B, C, and D, and if you signal to them which of your points are the most important for you, then it is implied that if human resources gives them to you, you will accept the job offer. 00:13:14 If you’re one of 20 recruits today, then contextually you may not be able to make the same requests as if you are one of 5 recruits. But it may be possible to revisit some of those compensation points down the line when the context has changed. When a person says No in a negotiation, what they mean is No (in the way I see the world today). Understanding the circumstances around why they said No today lets you know how, and when to get a Yes later on. 00:16:33 Don’t just negotate and then leave and cut off communications while you wait for their response. Stay in touch and stay involved because you never know what may change and you may learn new information that can help bring you closer to a better offer. If you let too much time pass between your discussions, human resources may forget about you and move on. At the very least, stay engaged and updated. It’s possible that their explanation as to why not could turn into an opportunity to overcome that limitation and create a yes. At the very least, the explanation as to why not allows you to decide whether or not you want to continue negotiations with the person or company. 00:17:42 Be prepared for the awkward discussions about you, your career, past failures, your expectations, your online activity or search results. etc. Examples may be asking you if you have other job offers, or why a recent 3 month trial period didn’t turn into a job offer… Instead of hoping they won’t ask, be prepared to answer the question and discuss it. If you’re unprepared for this discussion, your answer may sound like a lie, too defensive, unprofessional or illogical, like you’re trying to avoid the question. 01:02:03 In terms of contract clauses such as non-compete, termination, and quitting your job, an experienced interviewer will be used to having these disussions professionally and cordially, knowing that some employment choices simply don’t work out, and for many reasons. When discussing these contractual clauses, be professional and cordial yourself, and get down to the company’s real concern for why they want the clause in the contract, and then be prepared address that concern. 00:20:51 If the interviewer asks you “If we make you an offer tomorrow, will you say yes?,” and you’re not yet ready to commit to that company or to a compensation package you haven’t seen yet, or because you’re still waiting to hear back from a few other job offers, figure out why they are asking you the question. Is the interviewer really trying to back you into a corner? Or more likely, are they trying to gauge your interest in the company? Or, do they have a deadline by which they must fill this job position? At every stage in a discussion, whenever someone asks you a question, or says something ambiguous or that you weren’t expecting, investigate and ask for clarification so you understand the situation. The better you understand the situation, the more wisely you can respond to it. 00:22: 44 Nobody likes being told “We will never do X,” “That’s not possible,” or “Do X, or else…” Therefore, at least in the early parts of the recruitment process, don’t give or make human resources feel like you are giving them ultimatums, and don’t allow them to give ultimatums to you. In fact, your best bet would be to ignore the ultimatum because no ultimatum is ever final, and circumstances change (recall in tip 9 above that a No only means No (in the way that I see the world today). Ignore the ultimatum because if a person gives you an ultimatum and you acknowledge it, you have let that person paint themselves into a corner, and if later that ultimatum is modified that person will either be embarrassed and lose face or may become stubborn – refusing to change on principle. If instead, you ignore the ultimatum, and later that option becomes possible, you’ve allowed that person to change his or her position without losing face. People will only change their behavior when they can do so without losing face and without looking stupid. If a person gives you an ultimatum in the heat of the moment or because they are frustrated, then downplaying it will let them regain composure and get back on track in the negotiation. If, however, a person does intentionally gives you an ultimatum and really cannot do it under any circumstances, they will repeat it to you. 00:28:33 When human resources isn’t giving you everything you want, or appears to be fighting with you on certain issues, they’re not ‘out to get you.’ In fact, by calling you in for an interview to offer a job, they probably like you, and they want to continue liking you, at least to some extent. It’s just that you’re not their ONLY concern in life and they are juggling many different responsibilities. It’s your responbility to remind them of your deadlines or urgent circumstances, not their responsibility to be able to read your mind. If they’re not meeting your needs or responding to the deadlines you’ve requested, don’t automatically assume it is because they don’t like you. 00:30:02 Every person is different, and a large part of their reaction and position depends on their role in the company. Negotiating with your future boss is very different from negotiating with human resources, and require different tactics, strategies and assumptions, and you an glean different information from each person. You can still get the job if the human resources interviewer is slightly annoyed with you, but not if your future boss that interviews you is annoyed with you. Understand the interests and concerns of the person you’re negotiating with. Don’t walk away from a negotiation thinking“This company doesn’t value me” because of what one person in the company is saying. Instead, figure out who in the company values you and why, and how you can leverage that person to help you get what you want. 00:31:35 If you rush to get a job offer as quickly as possible, you may not negotiate the best possible compensation package you feel you are worth, and if the company then puts your offer on a deadline, that job offer you quickly rushed to may limit your opportunities. Look at the larger picture and think about the portfolio of negotiations and job offers you are doing. Sometimes the best process is the slowest process. 00:32:44 Don’t get into the habit of telling small lies or saying whatever needs to be said to get the job done or to get just a little bit better of a deal. In most cases, you can tell the truth and focus on the discussion of win-win outcomes and circumstances surrounding the negotiation, and still get what you want to get. Their answer will give you a picture about what is causing the restraint that is making the interviewer say No, and you are now in a better position to remove that restaint by conceding on another point, or expanding the scenario so that it can become a reality. 00:59:22 If you find yourself in a position where the interviewer wants to know the compensation packages you’ve received from other companies, assuming that they are not ‘out to get you’ (tip 14 above), then they may be interested in knowing this so they know how to structure your compensation package offer. The way you negotiate your compensation package should make them even more interested in working with you than before, when they were interviewing you. Negotiate in such a way that not only does human resources want to give you more, they like you more than before. 00:35:47 The more steps you take, the harder it is for you to turn around, pivot, change directions, and start over. What the average person with your age, education background, professional background, competence, etc. Also, by stating your objective criteria you’ve given human resources the justification they needed to argue your case to their superior for you and get you what you wanted. 00:50:20 If part of your compensation package is partial or full payment of your studies though school (sponsorship), don’t forget to step back and consider this as another point of interest in the compensation package rather than a completely separate issue. Also, seriously take into account the amount of money working for this company is saving you were you to pay your own way through university and then spend the rest of your lifetime paying off those student loans plus interest. 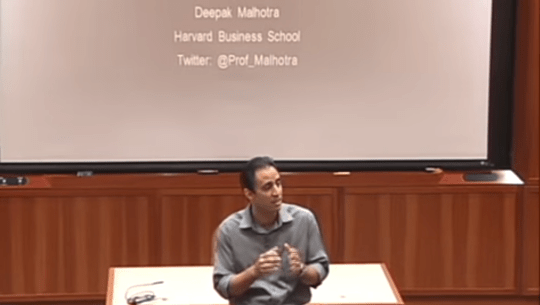 Posted on December 30, 2015 August 16, 2016 by Joshua SMITHPosted in videosTagged deepak malhotra, employment, harvard university, men, negotiation, videos, youtube. Pingback: 224. Getting to Yes: How to Negotiate When You’re The Weaker Party – How to Shape Human Behavior.